I should have written sooner, but it’s been a winter and a spring marked by surgery, hospitalizations, feeding difficulties, and gregarious giggling. It takes listing it as much–those startling rhythms–for me to note that perhaps there are good reasons for not having written, that this year has been so rough already, three months in, it seems anything but ordinary. Lucia, with her father, waking up from hip surgery in January. But while my attention has been swayed by nights in the hospital, the precise milliliter at which Lucia always seems to choke and aspirate, and the ramshackle solutions to trying to keep those calories inside her little body, I’m also starting an ethnographic project on disability and communication, and so I find myself watching the ordinary things we do together, too. Because she can’t see well and because we don’t have traditional conversations, I find myself instinctively doing things with Lucia that I wouldn’t do with anyone else. I place my face right up against hers as I’m speaking to her. When I say her name I watch for the flicker of recognition in her eyes. When I notice her lips are dry, I pick the large flakes from them and then apply balm, something she licks and smacks with eagerness, because she doesn’t eat by mouth. When her head begins to drop as it often does out of neurological lapse or fatigue, I guide her cheek and her chin back toward me without thinking. And when on the rarest of occasions, she turns her eyes to mine, I don’t know what it is about it, but I can tell she is really, really seeing me, and it is the holiest of moments, the simplest of pleasures, not just for her or for me, but for both of us–I’m certain of it. Feeling so certain of these ordinances and our bond with one another is something I never expected to buoy us in this extreme world of uncertainty. And so at the end of a long Monday, where I shuttled her to a rather bleak nutrition appointment, and she’d made the rounds on errands and to my office, all the while coughing and sputtering her feeds, because there was no nurse, I realized that it wasn’t what ostensibly might qualify as a great day. And yet, when I looked into her eyes that evening, I also felt so far afield from those early days when she’d cried incessantly and I couldn’t do anything to comfort her, and I’d text her father in exhaustion and desperation. I’d wonder whether she even liked me, and people thought I was being facetious, but I really wondered whether she even knew her mother was there. But here we are today. And suddenly, I felt it a great, extraordinary day, and choking back hot tears, I whispered to her greedily, “I wish I could keep you forever.” Because I realized that the really bad days and the great days and all the ordinary days in between, they will just never be enough. I’ve been so busy, struggling and surviving this particular climb through Lent that the hyper-ordinary had lost its resonance. But what I’ve been made to realize, especially with Easter so fast approaching, is how critically our family, as every family, lives in the space caught between abundant life and impending death. It’s not something I readily acknowledge. How can you? How can you go on living your so ordinary life when you are often reminded how fleeting, precious, and truly extraordinary it is? Just a few years ago, when we had the opportunity to meet other families of kids with AGS at a conference, I saw a grown man gleefully pounce on his 90-pound teenage daughter laying on a mattress in the middle of a hospital conference room and it put a lump in my throat to see how similar their modes of communication were to ours and to realize that loving Lucia wouldn’t ever have to change if we were lucky enough to know her that long. We could go right on loving her with abandon and conviction if we were just brave enough to do it. And on most days, especially because Lucia’s so joyful and go-lucky, she reminds us that there’s no reason to worry over a future that not just for us, but for all of us, is by nature highly uncontrollable and uncertain. But then again, when you’re so audaciously invited to taste pure, overflowing joy on a daily basis, there’s nothing ordinary about it, and it’s impossible to be grateful for your portion rather than ravenously thirst for more. So I try to acknowledge the precariousness of not just this life, but all our lives as the unbending site of where cups also runneth over, because we have received the gift of truly knowing our daughter, which I think every parent can agree, is actually altogether extraordinary. A few weeks ago I sat in the pews as my colleague and senior pastor led the prayers of the people, and I lifted one for Lucia’s upcoming surgery. My voice wavering, I asked for prayers not just for the doctors, for health, and for our little girl, but for my husband and for me. I explained that in facing another surgery that could have mixed results, I’d grown a bit weary and leery, and my faith was faltering. It’s so hard as a parent to make decisions for your child that involve both risk and reward. Lucia was doing so well, and I wondered whether another surgery was the most faithful decision. Could the congregation be my faith, could they lift prayers for us even as we were feeling weak? I wondered aloud. Mind you, I’m one of the pastors of this church, and I wasn’t sure how prayers for faith from one of the spiritual leaders in their midst would be received. But not a person came up to me that Sunday scolding me for my weakness, my fears, or my lack of faith. Instead, I remember lots of assurances that prayers would be lifted, many looks of concern on their faces as I spoke my prayer, and many knowing, earnest nods as I let them know that even for a pastor, sometimes faith is hard to come by. Fresh snowfall on the Princeton Seminary campus. All photos are mine. Several weeks have passed, and Lucia’s surgery has not only brought her incredible comfort from reflux, but she is now feeding into her stomach (instead of her small intestine), an intervention that seems to bring her the satisfaction of feeling full and the comfort and freedom of having natural breaks from feeding throughout the day. However, it is hard to describe the extent of the intangible transformation for her and for us: it feels as if there’s a part of her spirit that has been set free, and we are all growing closer, as she’s more alert, communicative, and joyful. As I reflect on the miraculous results of this surgery and this transformation, I am left with no other explanation than that God did that. This summer I felt that Lucia’s intestinal feeding tube had provided her unprecedented comfort, happiness, and tranquility, but these past few weeks, a transformed Lucia has smiled up at us, and I am in awe and so deeply grateful. Blue skies and the grad tower peek through the snowfall. But God didn’t just surprise us by transforming Lucia; rather such transformation is apparent in us as parents because of the faithful who love Lucia for who she has been, will be, and who she is. I’m writing this today because it’s so important to talk about what God has done and what God can do even when we struggle to believe, how God’s faithfulness transcends our wildest imagination. And I believe that those people in the pews who love Lucia so unconditionally are part and parcel of who I know God to be. What a gift it is to be part of a community of faith who accept me for my weaknesses, who pray for my child, and who do these things not because they expect results or know what’s in store, but because they desire to trust God–they are the faithful. And I am so grateful that in faith, we don’t have to go it alone–that God’s transformation happens through people, through prayer, and in us. I am so grateful that after all these years God is still full of surprises and one of those is that even when you falter, there’s faith enough for the least of these, for the faithless, the weary and the leery. In a world which doesn’t always recognize Lucia as fearfully and wonderfully made, it’s kind of miraculous that I’m surrounded by people who actually keep reminding me of that. And the fact that God did all that–well, these days my faith runneth over! And you can borrow it when you need it someday, I’m deliriously humbled and happy to owe you all a prayer or two. Perhaps that how faith works: we owe it all to God and to one another, but in being bound to one another, we are set free. One of those sweet smiles that makes the world stop! 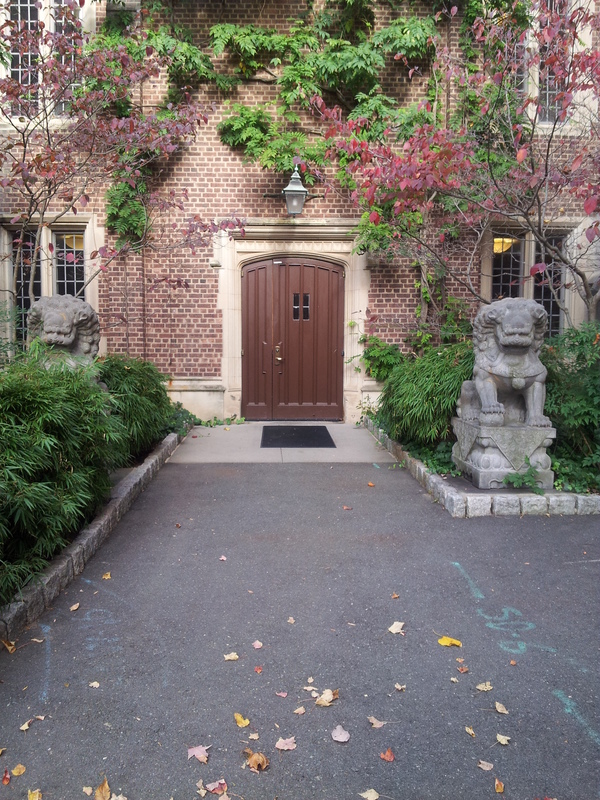 Princeton University campus. Gest Asian Studies library. My photo. It’s bad blogger etiquette, isn’t it, to post about this season of fullness and never fill one another in on what the true challenges and joys are, and generally how it’s going? For me, fullness is a mixed blessing. It’s been finishing the writing and revising of my dissertation on Sunday mornings, which has been necessary and fulfilling, but has taken us away from our dear church community and made me wander a bit from God. So fullness, ironically, in the vein of confession, has included a spiritual desert for me, in which I’ve been reticent to go to God with all of my worries and concern, for fear of finding answers that I haven’t wanted to hear or face. Fullness, though, has also been the everyday work of plodding along with life, filled with the everyday joy of seeing our daughter and our family grow together. It’s included brave car trips with a screaming baby, on the end of which we were fortunately met by treasured friends. I’ve been so focused on getting my own things done in this season of fulness that I often forget how faithfully God has stood beside me at this time and all along. In returning to acknowledge God, it makes sense that my first action, before repentance even, would be praise. Even as this makes cognitive sense to me, I’m still struggling a bit this morning. I pray that I find those words of praise even as my spirit is weak. Where has God stood beside you in your life? What is God doing for you now? How is your season of fullness coming along? Fall in Guangdong province, China. Click for photo credit. Psalm 23 is so short and sweet and familiar that for many of us the words tumble off our lips without a thought. But it’s no wonder that so many have clung to it over the ages, repeated its promises in the darkest hours and been comforted by its imagery in the depths of despair. Its simplicity and eloquence are timeless and poignant. And yet, there’s more to it than comfort and consolation. There are practical assurances that we will walk through dark valleys in this life despite our faith, that we will encounter enemies, and that these hardships are not mutually exclusive from goodness and mercy. Red Beach, China. Click for photo credit. These past few weeks I’ve been a little overwhelmed by the busy-ness of my life: childcare and feedings crammed between preparing for classes, editing my dissertation, and applying to jobs. And since I’m so averse to busy-ness, somewhere along the way, it occurred to me that framing that stress and pressure not as busy-ness but as fullness allow me to better see and experience the wash of blessings, difficulties included, in my life. In the psalm’s narrative, it is following the darkest valley that the table is prepared, the psalmist’s head is anointed, and his “cup overflows.” Therefore, when our cup overflows it doesn’t necessarily speak to the ease of life or conventional happiness, but a life well lived, a deep, resounding, and mature joy, and a conviction that God has been and will be there despite the valley, the enemies, and the fear. My favorite season in gorgeous Jiangxi, China. Click for photo credit. There is so much comfort for me in sleepless nights and rushed days to trust and believe that this season is not simply busy, but wonderously full. Full of hard work and deep joy, full of hard decisions and deep love, and full of uncertainty, but filled with grace. I take heart and solace in the fullness of life and the promise that goodness and mercy are not fleeting, but that I shall forever dwell in the house of the Lord.